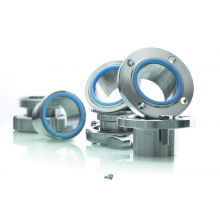 From design to manufacture, there are key factors that you must consider when designing your seals for use in a food processing environment where hygiene is the ultimate priority. Providing an assembly drawing will help us to understand your requirements; many FDA seals have fitment issues which can become costly and time consuming if not addressed at the outset – for example, many types of seal require an open housing and may be damaged or even unusable in a closed gland. An aluminium housing will dictate a different choice of material than a stainless housing. Exotic materials, if used for shafts, can also present a challenge, particularly if the seal needs to be FDA compliant; it is important for us to understand your requirements from the outset. The media that the seal is in contact with is an important factor in material choice, and it is critical that we understand possible changes during its operational life, or if it is likely to be needed for a whole range of media. Sometimes it may be necessary to have more than one sealing option available in order to allow for multiple cycle changes. Cleaning is absolutely critical in food manufacture operations – and processors go to great lengths to ensure a sterile environment; this can include very harsh media or clean in place and steam in place methods. The cleaning method can eliminate particular seal materials, or may lead to replacements being required for each pass; providing us with the relevant information at the outset can avoid costly and dangerous mistakes. The best way to ensure that seals designed for FDA use are safe, effective and easy to fit, is to involve a sealing expert from the outset. In order to ensure you design the optimum seal for your facility, contact us now on 023 8022 6330 or via email sales@martins-rubber.co.uk..
Read more about our products specifically designed with manufacturers in the food processing industry in mind. The post Designing seals for food contact appeared first on Martin’s Rubber Company.